Why alternative investment funds are gaining traction with wealthy Indians. Avendus Enhanced Return Fund (AERF), launched by global financial services company Avendus in India in December 2017, provided overall returns of 11.71 per cent till end-June this year, while the National Stock Exchange's Nifty rose 5.12 per cent in the same period. Even when the Nifty fell by 5 per cent in February, the fund's value had dropped by only 0.81 per cent. Ambit Alpha Fund (AAF), run by domestic financial services heavyweight Edelweiss Asset Management - which it acquired from Ambit Investment Advisors in September 2016 - has delivered 12-15 per cent returns every month, without once going negative. Both AERF and AAF are alternative investment funds (AIFs) - which go beyond the traditional asset classes of stocks, bonds and cash. Their numbers in India have been swelling - from 92 in 2015 to 395 now - while the assets they manage have grown from Rs70,266 crore in December 2016 to Rs141,119 crore in December 2017. These funds are of various kinds, but are all defined by their investment approach - not necessarily their platforms - whose prime objective is to generate enhanced risk-adjusted returns rather than total returns. "The goal of AIFs is to optimise returns and not necessarily to maximise them," says Vaibhav Sanghavi, Co-CEO, Avendus Capital Public Markets Alternate Strategies. AIFs invest in start-ups, real estate, private equity and more, some of them using strategies which mutual funds are not allowed to - such as taking a combination of 'long' and 'short' positions on stocks. "Investors are increasingly demanding products that are moderate in both return and risk," says Radhika Gupta, CEO, Edelweiss Asset Management Co. "AIFs are growing because there is increasing awareness of this category among high net worth individuals (HNIs), as well as an expanding pool of people who understand and sell such products." AIFs have low correlation with stock and bond markets, while their drawdowns (fluctuations within a given period) are less than in traditional markets. Unlike mutual funds, in which anyone with Rs1,000 (or sometimes less) to spare can invest, the minimum investment in an AIF is Rs1 crore. "Most big investors choose a range of investments, from the very short term - like liquid funds - to the very long-term - like physical assets or long duration products. AIFs can help them do so by meeting their financial needs across the planning spectrum, diversifying their portfolios and reducing volatility," says Sanghavi of Avendus. S. Naganath, President and Chief Investment Officer at AIF Franklin Templeton Alternatives, agrees. "If an investment strategy can deliver absolute returns, together with lower volatility, than the broader stock market, investors may be enthused," he says. "The key, however, is to deliver consistent absolute returns." The Securities and Exchange Board of India (Sebi) set out regulations for AIFs in 2012, defining them as all privately pooled funds - be they trusts or companies or limited liability partnerships - which are not covered by other regulations of Sebi or any other regulator. It divided AIFs into three categories. In the first are funds which are expected to have some larger positive impact on the economy beyond maximising own profits - venture capital funds, infrastructure funds, small and medium enterprises funds, social venture funds, etc. They have to be 'close-ended' (with a fixed number of units which are locked in till the term ends), must eschew leverage, and stick to the investment category they are committed to. In the second category are all other funds which too bar leverage - such as private equity funds, debt funds, funds of funds, etc. The third category comprises funds which use leverage, have no restrictions on asset allocation, can be close or open-ended, and can take both long and short positions - hedge funds, in particular. AIFs, especially those in Category III, use a range of nuanced and specialised strategies to increase value. One of Edelweiss's AIFs, for instance, its distressed assets opportunities fund, focuses on acquiring distressed assets of companies and non-performing assets of financial institutions, profiting as these assets are restructured. Again, investors in India mostly take 'long' positions on stocks - they buy stocks they expect to do well and sell them for profit after a period of time, when the sale seems expedient. Taking a 'short' position consists of 'hiring' - for a fee - stocks the investor expects to fall, selling them and buying them back after the price has dropped, to be returned to the original possessor, but thereby profiting from the entire transaction. This is one of the key strategies Category III AIFs employ. "India has historically been a 'long only' market, and 'shorting' is not well understood yet as a construct," says Gupta of Edelweiss. "But there are all kinds of companies - some doing great business, and some doing bad business. This creates a lot of opportunities AIFs can capitalise on." Even AIFs taking 'long' positions - which mutual funds perforce have to stick to by law - are different from mutual funds, and may respond differently to the same market conditions. 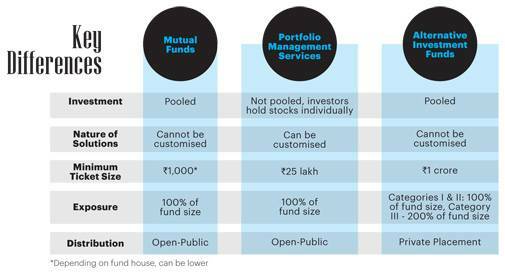 'Long only' AIFs allow for a degree of specialisation and concentration that might not be possible in a mutual fund. "Most 'long only' AIFs are close-ended, which means that once the funds are garnered the fund manager can deploy them in a continuous and staggered manner, as per his strategy," says Gaurav Mehta, fund manager at Ambit Asset Management. "With mutual funds, this is difficult as funds are often deployed in large amounts at the time of inflows when the market is doing well. Also, the pressure of redemptions when the market temporarily falls can derail the mutual fund's strategy in the short term." High net worth individuals (HNIs) have different ideas about what they want to do with their money - some may prefer private equity deals, others may be keen on increasing exposure to a particular sector, and so on. Unlike mutual funds, AIFs enable them to do so. "AIFs can make a spectrum of risk/return choices available to investors," says Prashasta Seth, CEO, IIFL Asset Management. Naturally, the investments need to guided by experts. "Portfolio construction entails research and technical analysis, both to determine long and short investment decisions and also to time them right," says Naganath of Franklin Templeton. "A key variable is the net exposure - long minus short - which has to be calibrated periodically, and where the portfolio manager makes all the difference." AIFs began in the mid to late 20th century in the US, and have since grown into $7 trillion-plus industry across the world. In India, though venture capital has existed for two decades, AIFs as a distinct asset class began only after SEBI passed its 2012 regulations. Edelweiss Alpha Fund was the country's first AIF, launched in June 2013, followed by DSP BlackRock Enhanced Equity Fund in May 2014. The most important factor to consider while investing in an AIF is the track record and credibility of the people managing it. The strategies being employed and the fund risk of the AIF should be clear, because the number of domain experts are still relatively few. 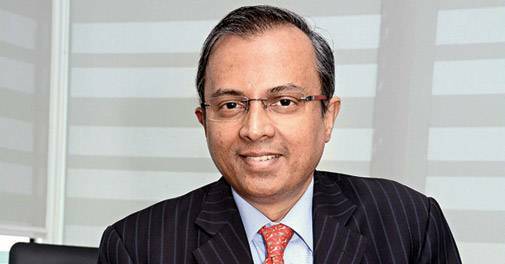 "The biggest challenge facing the industry is paucity of talent," says Gupta of Edelweiss. But there is hope that as the asset class expands, talent will be drawn to it. "Talent will come in," says Seth of IIFL. "Soon, there will be niche and boutique competition from skilled fund managers who prefer to start independent practices rather than join institutional offerings." A second challenge for the Category III AIFs is taxation. Category I and II AIFs have been given 'pass through' status - which means the investor is taxed, not the fund, barring a 'withholding tax' of 10 per cent on any income accrued. (For non-residents, the withholding tax varies.) But Category III is taxed at the fund level, not the investor, which means the investor's income is taxed, even if he could have avoided the tax at the individual level. No doubt, even HNIs will not put all their money into AIFs - such investments are meant to supplement portfolios, not replace them. "Globally, about 12-14 per cent of portfolios are allocated to AIFs, of which around 50 per cent would be in hedge funds," says Sanghavi of Avendus. "India is still a nascent market - AIFs' share of portfolios is minimal - but it is growing." Edelweiss's distressed assets fund, for example, is raising nearly $1 billion globally, of which $200-250 million has been carved out for domestic wealth clients. "Wealth is exploding in India, and as investors grow rich, their need for differentiated strategies will increase," says Seth of IIFL. "Growth will be very strong in the AIF segment with more and more strategies being deployed, creating a sophisticated industry." The true test of AIFs will be to show positive returns when markets are down. There is every likelihood of such a test in the near future. "Since late 2016, we have seen a robust bull run in global equities, so an environment of enhanced market volatility is quite likely in the next 12-24 months," says Naganath of Franklin Templeton. "Central banks are looking to tighten liquidity and increase interest rates which will impact bond yields. Inflation is also coming back. Higher volatility in currencies, trade tariff issues and geopolitical issues are emerging. An investment strategy that could capitalise on such volatility would be long/short funds and AIFs in general."